Published: July 31, 2018 at 02:49 p.m. Updated: July 31, 2018 at 06:58 p.m.
With late summer about to give way to the 2018 NFL season, it's time to once again rank all 32 offensive triplets (quarterback, running back and pass catcher) in the league. As before, I ranked the quarterbacks, running backs and pass catchers from No. 1 to 32, then assigned points to each player (multiplying each QB's score by 1.5, to account for the position's importance). So, for example, the No. 1 QB gets 48 points (32 multiplied by 1.5), the No. 1 RB gets 32 points, the No. 2 RB gets 31 points, and so on. Each team's cumulative score determined the final team rankings. Previous rankings are from August 2017. In the What have you done for me lately? NFL, it's not surprising that people have forgotten about Miami's playoff run just two years ago. 2017 was scuttled when Tannehill went down (despite the meh efforts of Jay Cavalleri). 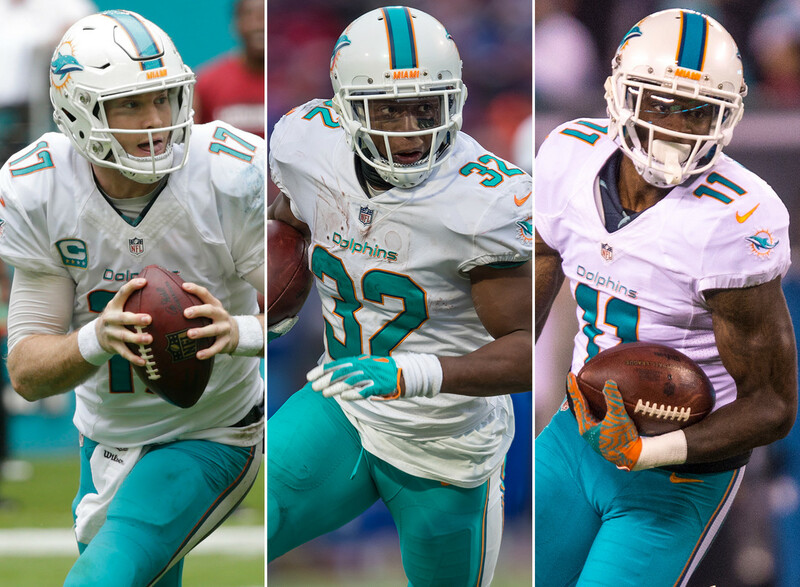 Adam Gase has seen some high-profile departures, but he knows what he's doing: Don't be surprised when Drake and Frank Gore put up good numbers running behind the left side of the Dolphins' line. As is true with several other teams debating between a veteran QB and a first-round pick, the Jets (who, as of now, have TWO veteran QBs to further muddy the waters) might want to consider this question: Are you going to win the Super Bowl with ANY of them? If the answer is no, why not start the future now? A glorious 2017 in Minnesota notwithstanding, Keenum is a J.A.G. (Just A Guy) who found himself under center on what was among the league's very best rosters. (Don't get angry, Skol fans -- if the Vikings braintrust disagreed, they'd have brought Keenum back for far less money than what they paid Kirk Cousins.) The caliber of the Broncos' offensive personnel is well below what Keenum played with last year, and the QB's numbers are likely to reflect that this season. How long can a 21st-century NFL team succeed while hiding its quarterback? The 2018 Jags plan to find out, as they attempt to build on last year's success behind the premise of smothering defense and a complementary run-based offense that spins the clock. Fournette wasn't healthy for much of his rookie season, but he was still dynamite. By the end of the year, there's a good chance Lee will be replaced as Bortles' favorite target by Dede Westbrook. The good news is, early camp reports say Flacco's having his best camp ever. The bad news is, the same thing's being said about two-thirds of the other guys in the league. Joe Cool was the Best QB of All-Time for five weeks about five years ago. However, there are another nine years and 10-ish months in his career to consider. Apparently, GM Ozzie Newsome was so troubled by the latter sample, he saw fit to draft Flacco's presumed replacement in Lamar Jackson. Now the only question is, how soon should the Ravens turn to the former Heisman winner? (Answer: Now.) With that defense, Baltimore could mess around and win the AFC North, but only with a QB who can make a couple of game-changing plays a week. Is it gonna be Allen over AJ McCarron and Nate Peterman? More importantly, does it even matter, when the line in front of any/all of them is as bad as it appears to be? (No. No, it doesn't matter.) McCoy remains one of the very best, but again, it's moot, given the overall lack of talent in the locker room. The NFL is a copycat league, but that doesn't necessarily mean copying others' success is guaranteed to boost your team's profile. Witness the 2018 Bears, who (too) many are expecting to deliver L.A. Rams-style overnight improvement after replacing their old-school coach with an allegedly bright young offensive mind. Apologies for the skepticism, but at least part of the Rams' '17 rise was owed to poor divisional foes (something that does NOT describe the NFC North competition this year). And as good as Howard is, he's not Todd Gurley. Between his much-celebrated career-long win streak and his much-lamented recent dating habits, Jimmy G has already experienced the highs and lows of the hyperbolic attention a starting NFL QB gets. Now for the hard part: boosting an offense that wants for more difference-making skill-position players, although smart Xs-and-Os guys will tell you McKinnon is the right fit for Kyle Shanahan's approach. The perennially underappreciated Taylor -- who doesn't turn it over, throws a great deep ball, is a running threat and is several months removed from taking his last team to the playoffs -- will nevertheless have to turn the keys over to No. 1 overall pick Baker Mayfield sooner rather than later. Hyde's performance hasn't consistently matched his pedigree, but maybe that'll change now that the former Ohio State star is back in the Buckeye State. Jarvis Landry, Corey Coleman and David Njoku form a nice group of pass catchers, but Gordon is the one who can take the offense to another level, as soon as he returns from the NFI list. Evans was down a bit last year, but with 32 touchdowns and almost 15 yards per reception over his four seasons, he's a rare talent who can make most any QB look good. He'll need to do exactly that for Ryan Fitzpatrick (if he wants to keep the Bucs afloat during Winston's three-game suspension to start the season) and Winston (if he wants to help wash away the would-be franchise QB's inconsistent play in what promises to be a brutal NFC South). Rookie Jones should at least ease that burden, assuming he can beat out Quiz Rodgers. If you watched the Raiders closely at the end of last season, it was fairly obvious Carr had lost confidence in Cooper (once deemed by scouts to be the most NFL-ready WR in a decade), looking him off before trying to jam a throw in to Seth Roberts. Now, though, Jon Gruden and new OC Greg Olson (who worked with Carr in the QB's promising rookie season) say they plan to turn the tide by running the offense through the 'Bama pass catcher. Hmm. On the bright side, Gruden would have a hard time being any less creative than the Raiders' offense was a year ago. Henry, a very large person, figures to transcend 300 carries with DeMarco Murray now retired. Walker will continue to provide five catches for 60 yards (and 0.5 TDs) every week. After a quietly disappointing 2017, Mariota needs to take games over more often than he has over his first three seasons, if new head coach Mike Vrabel is to build on last year's playoff appearance. A significant third season in the career of Prescott will be made more difficult by the lack of a proven game-changer to catch his passes, but at least he's got Zeke, pro football's most punishing finisher (who's also good at the start and in the middle portions of football games). In case you haven't been keeping up, here are a few things I've heard a few thousand times about KC's new starting QB: 1) He has a strong arm. 2) He's no longer in the Air Raid offense. 3) His father was an MLB pitcher. How this combination of factors adds up is tough to reconcile, but remember: Andy Reid has succeeded with just about every quarterback who's crossed his path, and with the NFL's second-best TE surrounded by speeeeeeedy WRs and a talented second-year runner, expect the offense to hold up its end of the bargain. While the eternally underrated Smith gets comfy, other skill-position battles make this trio tough to suss out. Let's go with pedigree -- and assume coach Jay Gruden will, too, in rolling with Guice, a ROY candidate behind a capable O-line, and Reed, who is among the best pass-catching TEs (unless he's not on the field, which was the case 10 times last year). Here's hoping Luck bounces back to full strength, starting Week 1. With the Stanford star out all of last season, Hilton unsurprisingly regressed a bit from his spectacular 2016, but there's not a lot else to scare the defensively dominant AFC South competition in Jacksonville and Houston. For his part, Mack is a playmaker -- whether he can serve as an every-down RB is another matter. The NFL's former median QB is now below average, but Dalton oughta benefit from a vast collection of weapons. For the Bengals' offense to get rolling, though, the O-line will have to show significant improvement from where it's been the last couple of years. If it's even a mild upgrade, Mixon should soar in his sophomore season. The terrific Baldwin is fueled by the doubts of outsiders, while the rare gem Wilson still seems to be the subject of similar vapid cynicism. Yes, the Seahawks appear to be sliding, but pointing fingers at Wilson and Baldwin makes no sense. And speaking of cents, Penny will be the starter despite Pete Carroll's gushing about Chris Carson -- NFL teams don't use a first-round pick on a backup RB. Now let's see if Penny was worth that lofty price, despite other, more celebrated runners still being on the board. The plan may be to go with Sam Bradford to start the season, but by hook or by crook, Rosen (the most talented QB in the '18 class) is gonna be in there sooner rather than later. And he'll benefit from the presence of a motivated Johnson and one of the five best WRs of the SB era. What a difference one year (and one coaching change ... and some other personnel upgrades ... and a weaker schedule) can make for a quarterback! It's not "hating" to take a wait-and-see approach with the QB who's been good for exactly half his career, but there's no doubting the greatness of Gurley, while Cooks is, at minimum, a slight upgrade from the combined 2017 contributions of the since-departed Tavon Austin and Sammy Watkins. Forget the What might have been story, had Watson stayed healthy last year. Focus instead on what could still be upcoming for this team. Of course, Houston's pass-rushing trio has usually gotten the headlines (maybe more than ever in 2018, with some good collective health for J.J. Watt, Jadeveon Clowney and Whitney Mercilus), but it's Watson -- along with the uber-talented Hopkins -- who can finally elevate Bill O'Brien and Co. beyond a mere AFC South title. Two of the bigger (albeit obvious) lessons the 2018 Giants seem to have learned from the 2017 Giants offense: 1) It's better when one of the most talented pass catchers in the world is participating. 2) It's worse when there's no one who can effectively provide the team with a non-passing option. Enter Barkley and an upgraded O-line, who -- along with OBJ -- figure to collectively Eli-vate their QB this season. Cousins was a great Cinderella story in D.C., but now, he must rise to the role of leading man while making Vikes fans forget their more cost-effective 2017 underdog, Case Keenum. He'll get as much help as any QB in the league from his dandy collection of receivers, led by the electric (and now affluent) Diggs. All that said, Cook's potential rebound could play the biggest part in another deep playoff run. The G.O.A.T. is back and will no doubt dominate with rising star Adams. And new for 2018 ... the Pack might have an actual run game! As of this moment, it appears Williams has the inside track on the suspended Aaron Jones and Ty Montgomery (and given the relative lack of WR depth, the Pack might be better off putting No. 88 at his original position), but outside of one strong 2017 performance against the weak Bucs D, Williams hasn't given Mike McCarthy reason for outsized optimism. Rarely has the sports world seen such a bemusing case of beauty being in the eye of the beholder. No, the future Hall of Famer (yes, Newton's getting a gold jacket, whether you like it or not) is not as accurate as surgeons Tom Brady and Drew Brees. But, of course, neither of those QBs possesses the unique skill set (or hat collection) of Charlotte's dabbing Superman. Don't like that? Here's another one: Olsen is ALSO getting a gold jacket. And while it's premature to say what kind of post-career accolades await McCaffrey, he flashed enough as a rookie last year to indicate he'll be dangerous as both a runner and a receiver in 2018, so long as new OC Norv Turner can figure out how best to deploy his distinctly 21st-century personnel. Talking up any team in August is specious work, given the inevitable training-camp injuries to come ... and that's never more true than it is with the Chargers. The Football Gods just need to give this team a break from here on out (after already taking TE Hunter Henry and CB Jason Verrett); otherwise, the Bolts are loaded. Another high-end season from Old Man Rivers should be enough to earn him a gold jacket and, in the meantime, could also yield a Super Bowl appearance, IF home-run hitter Gordon and Allen, the second-best WR in the NFL, can stay -- ah, you know the rest. Funny what raised expectations can do: After Ryan's MVP season in 2016, he and the Falcons' offense were perceived as a disappointment last year, despite winning double-digit games and almost taking down the Eagles in Philly in the Divisional Round of the playoffs. Optimistically, Year 2 in coordinator Steve Sarkisian's offense should yield better results with Jones (the physical peak of our species) balanced out by rookie receiver Calvin Ridley and the ongoing run attack led by Freeman and his pal Tevin Coleman. Brady's age (41 as of Aug. 3), the murky details of the Jimmy G deal, Malcolm Butler's absence in Super Bowl LII (which likely cost Brady a sixth ring), the missed OTAs and Gronk's flirtation with retirement might lead some to predict the looming demise of the Pats, but don't take the bait. Meantime, look out for the latest product from Running Back U (a.k.a. Georgia), the most talented runner in NE since Corey Dillon. It's a distinct luxury, having the game's best receiver AND all-purpose RB, plus a HOF QB who might rank among the 10 best of the Super Bowl era by the time he (actually) retires (instead of just talking about it). That said, heading into what could be their final season together, it'd have to count as a colossal disappointment if this trio doesn't reach a single Super Bowl.